It’s been around three months since I last blogged. Did you miss me? Part of the reason I didn’t blog over the summer was cause it was summer. And if you follow me on Instagram or Facebook you know I traveled a lot over the summer. We were in our own home for maybe three weeks. Which means no cooking. The bigger reason though, was that I applied for a job in May. A friend told me about an opening for a Tourism Director for our town. My resume was perfect for it, and it paid incredibly well. It was full time, though, so I was a little hesitant about applying for it, but two other friends applied too, and we were hoping they might let us job share. The main reason I applied though was I was told about the job right after I had a conversation with Michael. The conversation involved Michael asking what I do to help out the house. Now, hold your gasps and cries of outrage, cause he was 100% right. I was barely cooking, and when I did cook he normally had to stop at grocery store on way home from work to get supplies. And of course, I barely clean. We only own a stick vacuum and our “mop” is a swifter. And I’ve started offering Averi a quarter to dust. 🙂 I wasn’t even getting the clothes washed, and Michael was having to help do that at night too. I actually thought I had a solid reason for not doing the laundry though. I don’t like clothes sitting in the washing machine after they are done. I feel like I can see and smell mold if it’s longer then 30 minutes. And Michael doesn’t like it sitting in the dryer when done because wrinkles set in. And since I don’t iron, the less wrinkles the better. So I explained to Michael that I could only do laundry if I was home for a three hour block, and I never am during the day. Valid reason, obviously. So I didn’t argue. Cause again, he is right. As I told him, though, I haven’t changed. It’s just our circumstances have. When we first met we both worked full time and shared the house load. Then we had Averi and I was busy with her all day. And I had told Michael when we had her that I was a stay at home, not a housewife. There is a huge difference. But now Averi is in school seven hours a day. Making me more of a housewife then a stay at home. And I don’t want to be housewife (unless it’s of Beverly Hills. And I’m Lisa). In the end I promised Michael that I would spend one day a week being productive – grocery shopping, doing laundry, etc. But I have a bad feeling that the one day would be a slippery slope and soon I would have to start being productive more then one day a week. So when faced with the choice of being a housewife or working full time, I opt for full time work. After I turned in the resume though, I realized that having a blog that mocks Miami and my town probably won’t help me get a job as a Tourism Director for that town. So I put a hiatus on the blog. Sadly, though, I just got a letter saying that the position has been filled. They hired an advertising agency (without ever interviewing anyone!) to handle it. So while I still need to be a (not so real) housewife, the blog can begin again! To that end I was highly productive this weekend. I did lots of laundry, paid bills, grocery shopped, made muffins and soup for Averi’s first week of school, and even cooked dinner last night. A Saturday night! I should get extra points for that. I’m practically Donna Reed. The original recipe called for fish sauce, which I didn’t have. But I decided it was better to leave it out because I figured I stood a better chance of getting Averi to eat it without. I also didn’t have the scallions it called for, so I substituted cabbage so it would still have the texture and crunch of something else. The recipe also called for “spicy mayo”, but didn’t say what that was. So I kept the Asian theme going by mixing mayo with sriracha. It was a nice contrast to the freshness from the cilantro and lime. And the pork was really moist. They were a great change from a regular burger, and have convinced me to keep ground pork on hand. Because I will be grocery shopping and have a stocked fridge. Mix mayo and sriracha together. Add more sriracha if want spicier. Set aside. Combine fish sauce if using, garlic, soy sauce, ginger, lime zest, lime juice and cabbage. Add pork and cilantro, gently mixing to combine. Divide mixture into four portions and make patties. Heat canola oil in skillet oil is hot. Cook burgers 12-14 minutes, turning once. 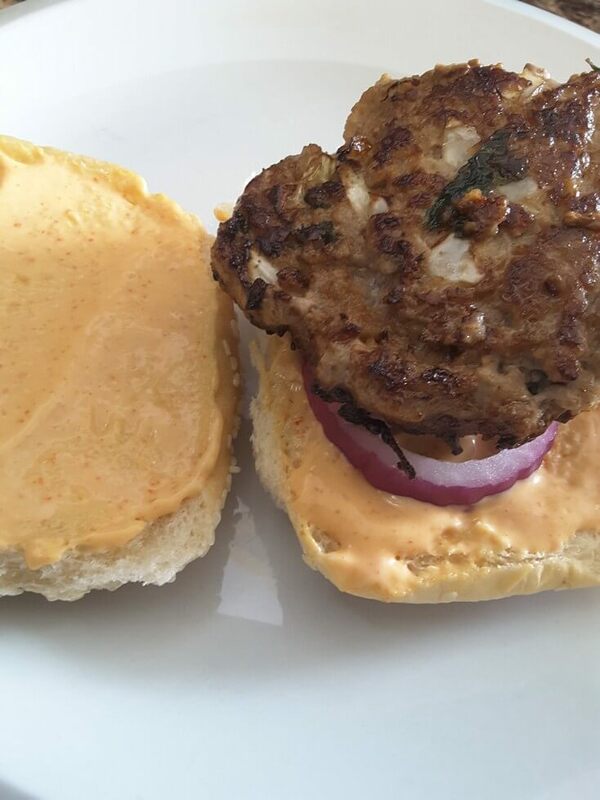 Spread mayo onto hamburger buns and add cooked burger.